I mentioned that yesterday I made this Orange Cake. My first reason for making it was that it looked delicious and light and would give me a reason to stop thinking about my portfolio for a bit. And after I committed to making it, I realized that it's also really transportable - and I felt that was worth of another mention. As person in a city where most of the people do not have cars, we're always having to compromise with what we can take where. Can I bring this on the T? Will it fit on my bike? 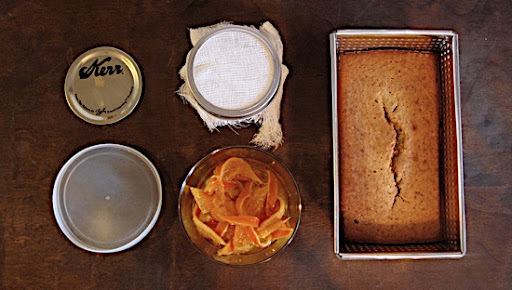 This cake is baked in a bread tin and topped with an orange marmaladesque topping and powered sugar. You can keep the cake in the tin, put powdered sugar in a short mason jar (I have a ton of these, I much prefer storing in glass than plastic and the Salem Street Hardware Store lets you buy them individually) with cheese cloth over top and put the orange topping in another small container (these in particular are from Crate and Barrel and I use them often). 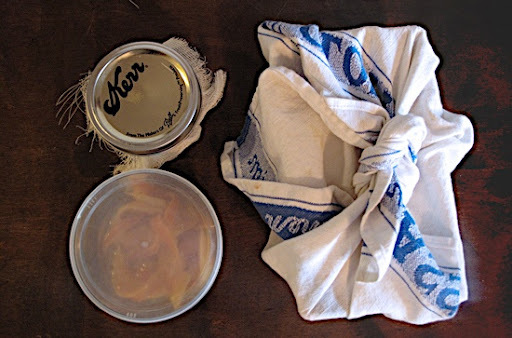 Lid and wrap and put in another bag and you're ready to go, easy for the subway or a bike ride. 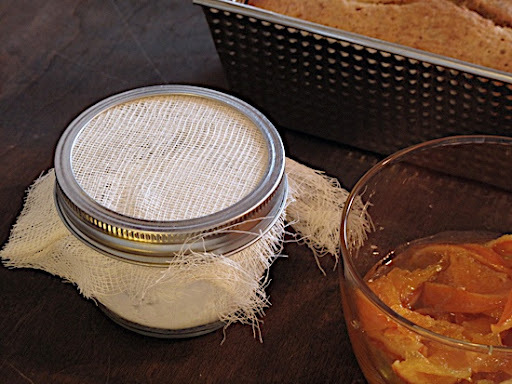 When you get to where you're going you can easily heat up the sauce and cake before serving at your destination - and when you dust it with powdered sugar it will hardly look like something that's bumped around on it's way there.